Festival dates are often memorable for surprise guests, but Noel Gallagher’s shock addition to the bill at Jersey Live was a little less welcome. As crew members unloaded the gear, they discovered a green-fanged spider that had stowed away in a guitar case. The discovery forced the festival to impose a quarantine until the danger could be averted. Spokeswoman Jayne Houghton said: "Staff immediately set about catching the spider and an area backstage had to be quarantined for nearly 20 minutes. 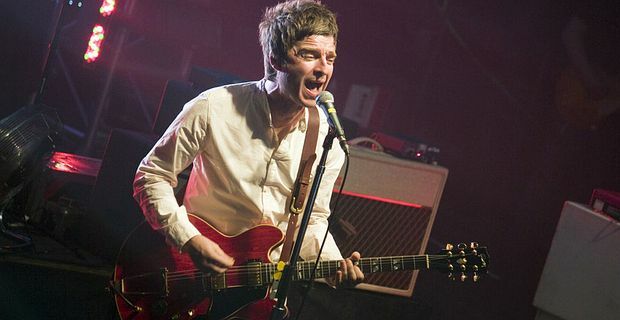 Noel had not arrived at the gig and so was blissfully unaware of the panic the spider caused." Matt Goetz from the Durrell Wildlife Trust was fortuitously fund-raising at the festival. He collected the spider and kept it in a jar on his desk. Although he wasn’t sure the spider was dangerous, he thought the quarantine was a sensible precaution. "If they come to Jersey from god knows where and a spider jumps out of, it could be a dangerous spider from the tropics," he said. A cursory look at Gallagher’s tour schedule revealed that in fact he had been in the less-than-exotic climes of Paris, Dublin, Belfast, Stafford and Chelmsford. Gallagher’s High Flying Birds were headlining the Jersey festival. It’s still not clear where the spider came from, although it is not beyond the realms of possibility that it might have been a surprise gift from Noel’s not-so-loving little brother Liam. The tour continues with dates in the UK, Europe and the Far East, where there is considerable more potential for recruiting dangerous insects and reptiles to the tour crew.